Candy gets hungry #3: Tsujiri Uptown | C A N D A C E .
Craving for japanese sweet treats? Love green tea? Then you've probably heard of the highly raved Tsujiri Malaysia located at Uptown Damansara, PJ! After hearing this name so many times and everyone telling me I absolutely have to try this place, I can't possibly turn down my bbgs asking me to go on an ice cream date with them right? No matter how empty my pockets felt that day! Tsujiri is located at Uptown. The word 'uptown' sounds pretty scary when placed along the lines with the word 'parking' right? Thankfully, their underground car park is opened so we parked there. I'd suggest finding out which exit to park near to, that way you guys won't have to walk to far. So far, I've visited this place twice and here's my honest thoughts on it. I really love the clean minimalist feel Tsujiri has to offer. The chairs are pretty comfortable to sit on as well. I personally find the tables slightly close to each other though. Just slightly, but I guess the crowd at night really requires such seating plan. Both of my visits to Tsujiri were on weekday afternoons so I didn't have to worry about long queues. Lucky me! Tsujiri Houjicha Parfait ( RM16.50 ) - You can choose between brown rice flakes or corn flakes. Plain O-matcha soft serve ice cream in a cup ( RM 6.50 ) Got this during my second visit cause I had to visit someone.♡ Toppings like shiratama, kinako kuromitsu, red bean, chocolate chips or genmai are available as add-ons well! You may also opt for a cone instead! For the o-matcha latte? Definitely! I do recommend all green tea lovers to try this place out though! They also have a 10% discount for aeon card members on weekdays. So don't forget to bring your card along if you're planning a visit on a weekday! a nice place to hang out and have nice cool dessert and drink. Am a fan of parfait. I visited once before to try but guess weekend evening is their busiest time. The place was crowded and there was little place to wait for takeaway orders. But I love their products, maybe visit when they aren't busy. Oh dear, you just hit my soft spot for Japanese desserts! Thanks for introducing! The desserts look so awesome but they do seem a little pricey. But then again, it is Japanese, what was I expecting?? I saw something similar here also in green tea flavour but never gave a try though looks great. 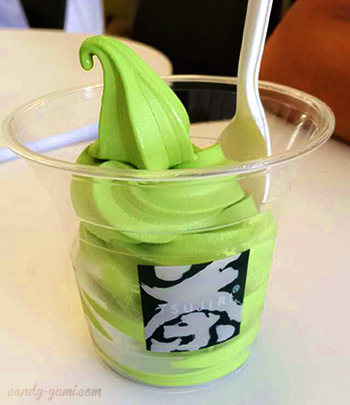 Plain O-matcha soft serve ice cream in a cup this one look really really yummy seriously !!! Finally I have a new place to recommend my tea lover friends. Till late means around 2am? Wow! this looks tempting. Do you get it in SG also? I want to plan a date day at Tsujiri too! I love all the Green Tea Dessert hehe although my friend say the price there is quite pricey! will bring my friend who is a matcha lover to the place. it seems very interesting!! Saw this shop during my interview, should drop by someday to try it out! tsujiri! was there for their grand opening.. love their green tea ice cream. Looks interesting but sigh, the place is a mad traffic hell hole :( Will visit once MBPJ is able to solve the illegal parking situation there. I love green tea so much . The price is a bit pricey for me. Will visit Tsujiri to give a try on the soft serve and decide whether it worth for me to revisit again. The green tea matcha looks really nice in the picture but so sad to hear that it doesn't taste as nice. Thanks for sharing!